Sailor Moon fans who have been holding out for the English version can finally watch the new Sailor Moon anime. The first two episodes of Sailor Moon Crystal are now available to watch on Hulu and Neon Alley. We also have some news about the home video release. The Dark Kingdom story arc, which includes Acts 1 through 13, will be released on DVD, Blu-Ray and Limited Edition Blu-Ray February 9th. The three versions are available to pre-order on Amazon. 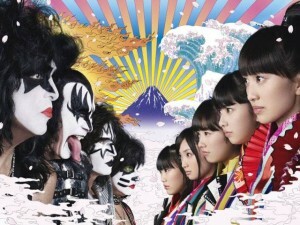 The DVD will be $44.82, the DVD and Blu-Ray combo pack will be $69.99 and the limited edition combo pack will be $79.98. For many fans this may be the first time they watch this series. 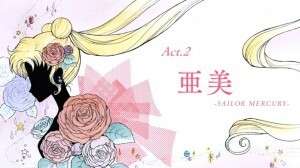 Act 1, Usagi – Sailor Moon, is the first episode of the series based on the first act of the Sailor Moon manga. 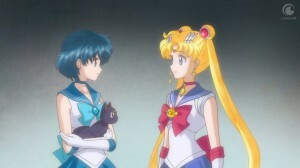 In it young Usagi meets Luna who lets her transform into Sailor Moon. 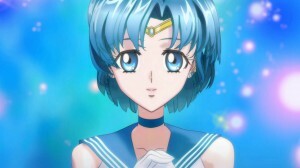 Act 2, Ami – Sailor Mercury, wastes no time in introducing us to the second Sailor Guardian the genius girl Ami. 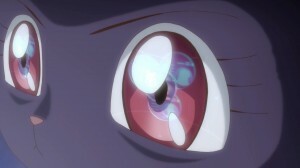 Long time fans may note strong similarities between Sailor Moon Crystal’s first two acts and the original anime episodes 1 “The Crybaby: Usagi’s Beautiful Transformation” and 8 “The Girl Genius Is a Monster: The Brainwashing Cram School of Horror”, but this is just because of similarities to the manga. The original anime series told the story at a much slower pace and quickly deviated from the manga so fans will be surprised to see just how much things change along the way with this story. 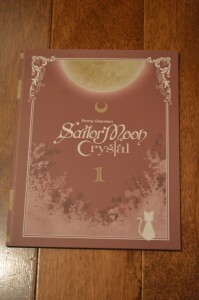 Sailor Moon Crystal was a very faithful manga adaptation, so this is a great way to appreciate the original story. Next week will be Act 3, Rei – Sailor Mars, which again moves the story along quickly by introducing yet another Sailor Guardian. This gives a good indication of the faster pace Sailor Moon Crystal is taking. For those fans living in Canada, or elsewhere who can’t view the region restricted content on Hulu, I would suggest using some sort of proxy to view the content. There are many options to do this, some of which you will need to pay for, but a free option is Hola.org. As we previously mentioned, the English dubbed version of Sailor Moon Crystal will start being released this Friday, with a new episode being released every Friday after this. These can be streamed online on Hulu and Neon Alley. To mark this event Viz will be holding Moonlight Party 5, at 6pm Pacific Time, 9pm Eastern Time, this Friday. This event will stream on YouTube. The episodes themselves are not part of the stream, which does not suffer from the same region specific problems that Hulu does. As always there will be contests where you can win prizes. You can watch the event in the embedded video below. To learn more about Moonlight Party 5 check out the Facebook Page for the event. 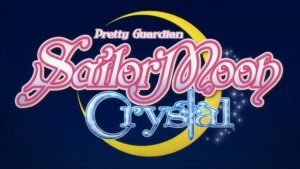 Great news for fans who have been waiting to see Sailor Moon Crystal in English! The anime schedule for Viz Media has been updated with the first two episodes of the English dub of Sailor Moon Crystal beginning Friday November 20th. The 3rd episode will be available on Friday November 27th with new episodes being available every Friday. New episodes can be streamed for free on Hulu and Neon Alley in the United States. If you live in Canada, or in another country in which these services are not offered, you’re out of luck. There are of course ways to make it appear as if you are accessing these sites from another country. A free option is hola.org though there are others. As we have mentioned before the cast for the English dub of Sailor Moon Crystal will be the same as that of Viz’s new English dub of the original Sailor Moon anime. Chances are if you liked that dub you will like this one too. 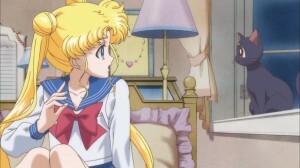 Will you be watching the English version of Sailor Moon Crystal? Have you been holding off watching it until this version is out? This is also a great option for children who are too young to follow subtitles. 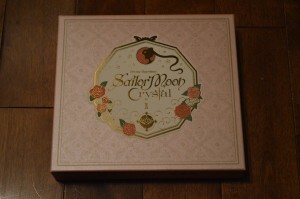 The first volume of the Sailor Moon Crystal DVD and Blu-Ray was released on October 15th. There are a few versions of this release at different price points. I ordered the Deluxe Limited Edition Blu-Ray version. This release only contains two episodes of the series, act 1 and 2, showing us the introduction of Usagi and Ami. You can order the volume 1 deluxe limited edition Blu-Ray (Amazon Japan, CD Japan), regular edition Blu-ray (Amazon Japan, CD Japan) or DVD (Amazon Japan, CD Japan). The deluxe limited edition has a lot included, but at 5994 yen (about $53 US) it’s a hefty price tag for only two episodes. These are Japanese discs. 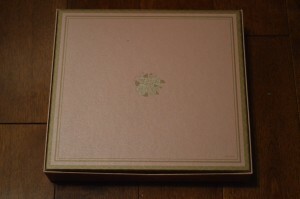 The Blu-Rays are region A meaning they will play in a North American Blu-Ray player or PS3, but there are no English subtitle or audio tracks. The packaging is impressive. 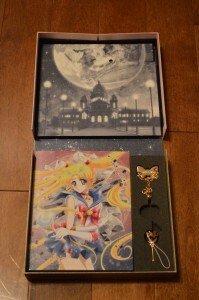 The first thing you will notice when opening to box is that it plays the Moon Pride theme song. 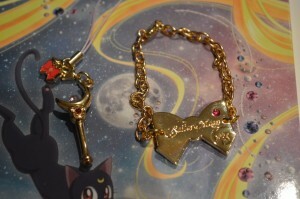 Inside are the Moon Stick charm and charm bracelet. Should you choose to continue to spend large amounts of money on the limited edition Blu-Rays you will be able to collect the other 12 charms. Also included are two books. The first includes art from the show, episode summaries and interviews with Munehisa Sakai, director, and Kotono Mitsuishi, the voice of Sailor Moon. 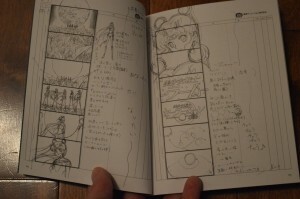 The second is a book of storyboards of the opening and ending themes for the series. There is not a ton to the Blu-Ray itself. As mentioned there are only two episodes, which auto play when the Blu-Ray is started. As we previously mentioned there are some scenes which have been reanimated since the original streaming version was released. This includes the changes to the intro. For example, Queen Serenity has white hair in the intro instead of being blonde like in the intro for the first two streaming episodes. These changes are minor and cosmetic. It doesn`t fundamentally change the experience of watching the show. Overall the video quality is quite good, which is not surprising as the Crunchyroll HD feeds were comparable. The disc has some special features. Mainly the textless opening and ending themes. There are also two audio commentaries, though as they are in Japanese I did not find much use in listening to them. Overall this set is expensive and while there are a decent amount of cool knick knacks, only including two episodes lowers the value. If you’re a collector or completist, it may be worth picking up, but if you’re just looking to watch the show, the streaming versions are perfectly acceptable. It’s quite likely there will be an eventual North American Blu-Ray release with English audio and subtitles. Fans who don’t like to watch their anime raw may prefer to wait for such a release. If you’re looking to watch the updated animation with English subtitles, you can download them from Sailor Moon Center. As of posting this article only episode 1 has been released (720p, 1080p), but episode two should follow shortly. Keep reading for more photos of the set. The upcoming Blu-Ray and DVD release of Sailor Moon Crystal, coming October 15th in Japan, will include some touched up scenes. 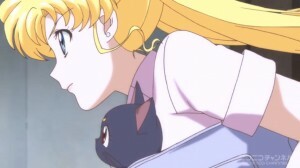 A lot of fans had issues with the quality of some of the animation in Sailor Moon Crystal when it was first streamed and now some of these scenes have been reanimated. A video has been released on the official Sailor Moon YouTube Channel showing new scenes. This video on it’s own doesn’t show anything obvious but when we compare these clips to the original version we see the difference. Screenshots included in this post show that some scenes seem to have been completely redrawn though many others have not been modified at all. The footage only contains scenes from the first two episodes as there are only two episodes included in each volume of the DVD and Blu-Ray release. There has not been any announcement about a North American video release. Pre-order the volume 1 deluxe limited edition Blu-Ray (Amazon Japan, CD Japan), regular edition Blu-ray (Amazon Japan, CD Japan) or DVD (Amazon Japan, CD Japan). How do you feel about these changes? Many fans are happy with them though this brings up an age old debate amongst fans of all things about the state of a work of art as either a fixed event in time or a constantly growing and evolving work. Certainly many movies will have a “director’s cut” or include a few new scenes in a video release, often including the original version. The extreme example of this would be something like the Star Wars Special Editions including drastic often unwelcome changes and who’s director is openly hostile towards fans of the original unaltered versions. Somewhere in between are things like the Final Fantasy Advent Children Complete Edition. I consider myself a bit of purist, as can be inferred from my less than kind reviews of these Star Wars DVDs or the Ghost in the Shell 2.0 Blu-Ray. That said, I understand these changes to be minor and generally positive without any major change to the original work. All redrawn scenes have the same poses as the originals, just with slightly more polish. No guns replaced with walkie-talkies here! One has to wonder what motivates this change? Why not just do it right the first time? It’s no secret that the show’s production was quite rushed, including a number of delays. With a twice monthly release schedule there are obvious time constraints with making this show. Perhaps there was just a shortage of time with the first few episodes. It’s also possible that the show’s success was underestimated and with a higher budget it’s now possible to go back and put more polish on some of the more sloppily done scenes. It remains to be seen if such changes will continue for many of the later episodes or if the higher quality of animation will simply become commonplace in the future. Act 3 had some pretty questionable scenes but the latest episode looked quite good. 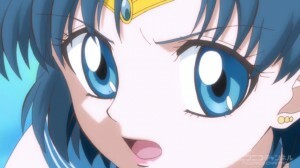 Sailor Moon Crystal Act 2, Ami – Sailor Mercury, premiered July 19th in Japan and worldwide. It’s available to view on Crunchyroll, Hulu and Niconico. This episode marked the introduction of Ami Mizuno who we soon discover is actually Sailor Mercury. As with the first episode, this story follows the manga very closely. 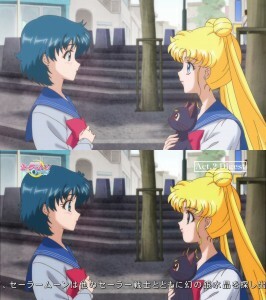 The episode where Sailor Mercury appeared in the original Sailor Moon anime was also fairly faithful to the manga, so fans of the old show may see some similarities there. It would be easier to list the differences to the manga than the similarities. The main ones that come to mind are Ami seeing an image of Silver Millennium when she touches Usagi and Sailor Moon attempting to reuse her Supersonic Waves attack. 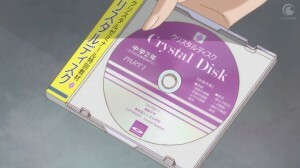 Once again we see that this adaptation follows the newer version of the Sailor Moon Manga as the Crystal Disk is actually a CD Rom and not a 3.5″ floppy disk as it had been in the original publication of the manga and 1992 Sailor Moon anime. We can conclude by this that the series does not take place in the early 90s, but either some time later or in the present time. The episode starts out with our introduction to the genius girl Ami, who’s scoring perfect in her tests, getting the best grades in her class. Her genius is in part attributed to the Crystal Seminar, a new cram school she and other students are attending. 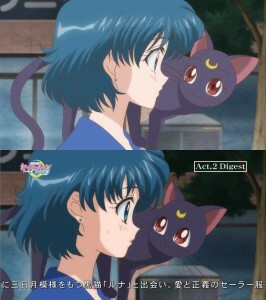 Luna is looking into Ami which leads her to have suspicions about the Crystal Seminar, which is actually a plot by the enemy to brainwash smart students into helping them find the Silver Crystal. Usagi befriends Ami who turns out to be a whiz at video games. Once her true identity as Sailor Mercury is revealed their new friendship moves to a whole new level. This episode also includes the introduction of the Disguise Pen which Usagi gets by tilting the Sailor V arcade game. She uses it to transform into a doctor in order to sneak into the Crystal Seminar. 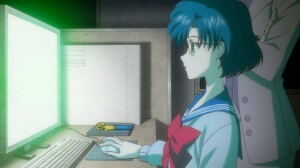 In one scene where Luna is investigating Ami with her computer we can see that she’s also looking into Tuxedo Mask. There’s also a silhouette of Rei with little info about her but her name is visible in the reflection of the screen seen in Luna’s eyes. The final scene shows us our first look at the Hikawa Shrine and Rei Hino, who will soon become Sailor Mars. The Niconico feed gives us a next episode preview for Act. 3, Rei – Sailor Mars which will be playing in two weeks, on August 2nd at 7pm JST, 6am EST and 3am PST. Once again we are following the manga with a story of the cursed 6 o’clock bus which introduces us to Sailor Mars. 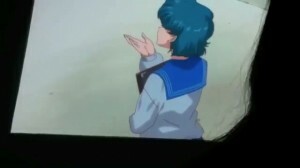 The preview shows us our first look at Zoisite who didn’t show up until much later in the original Sailor Moon anime. 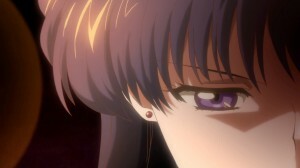 Will Sailor Mars kill Jadeite in the next episode like she does in the manga? Keep reading for more screen caps of the episode and next episode preview. The second episode of Sailor Moon Crystal, Act.2 Ami – Sailor Mercury, will be available tomorrow at 7pm Japan Standard Time which is equivalent to 6am Eastern Standard Time and 3am Pacific Standard Time. Check out our instructions for watching Sailor Moon Crystal to see how to check it out on Crunchyroll, Hulu or Niconico. 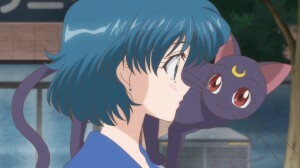 As the title suggests this episode will mark the introduction of Ami Mizuno, Sailor Mercury. Watch the next episode preview as a teaser for what’s to come.